Explanation: Two galaxies stand out to casual observers in Earth's Southern Hemisphere: the Large Magellanic Cloud (LMC) and the Small Magellanic Cloud (SMC). These irregular galaxies are two of the closest galaxies to our Milky Way Galaxy. 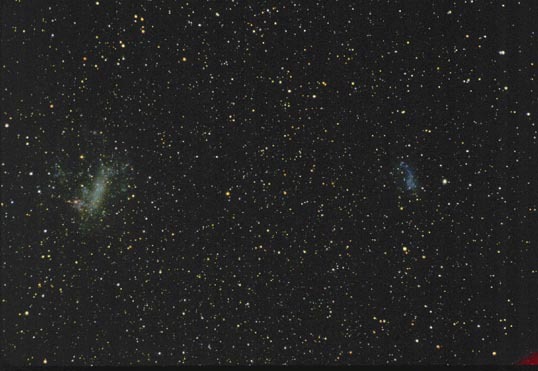 Recent observations of the LMC (on the left) have determined that it is on a nearly circular orbit around our Galaxy, and have even helped in the determination of the composition of dark matter in our Galaxy. The above photograph spans 40 degrees. Visible on the lower left of the LMC is the Tarantula Nebula (in red). In the foreground to the right of the SMC is globular cluster 47 Tucanae, appearing here as a bright point of light.